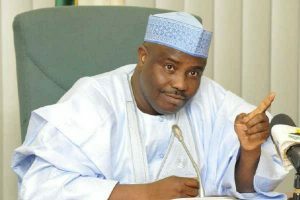 Barely 11 days to the presidential election, opposition Sokoto state governor Aminu Tambuwal has lost his spokesman to All Progressives Congress (APC). The Commissioner for Information, Malam Bello Goronyo, defected to APC on Tuesday at the APC’s rally in Wamakko. Goronyo, who was also the State PDP’s Campaign Council’s Publicity Committee Chairman, said his defection became necessary due to many reasons which he would reveal at the appropriate time. He, however, said that his action was to complement the laudable initiatives of President Muhammadu Buhari. “I am here to formally inform the people that I have return to my real home, I have resolved to follow the president and Sen. Aliyu Wamakko for their integrity and developmental stride in the state. “Therefore, we will together continue to move the train to the nooks and crannies across the three Senatorial Districts of the state to enable us succeed in the general election,” he said. “On election days, the electorate should also be vigilant and ensure that, only voters who hail from their respective polling units cast their votes in the various areas. “I have no doubt that victory is ours by this impressive turnout and support shown by the people as well as keeping the momentum across the state,’’ he said. The governorship candidate of the party, Alhaji Ahmed Aliyu, stressed the need for the people to vote for credible leaders and promised to consolidate on the unrivaled achievements of Wamakko. “If elected, I will strive to emulate Wamakko’s achievments, and urgently fill the existing wide gap in terms of the deficit of developmental projects in our state,” he said.